New from Ty, this "Flippables" plush key ring is a fun new way to cuddle with your favorite TY plush animal. and take it wherever you go! Use it to find your keys, or to decorate your backpack. It is sure to turn heads wherever you decide to hang it. 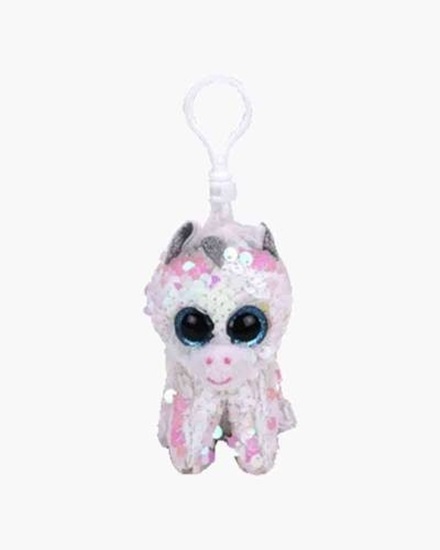 Now you can bring Diamond the Unicorn with you wherever you go! Ty Flippables Clips snap easily onto backpacks, suitcases and more, making them the perfect school or travel companions. Diamond even features sparkly sequins that change from pink to white with the swipe of a hand! "Diamond" is approximatley 3.5 inches tall and is perfect for ages 3 and up.